African countries are most often chosen as a destination for terminating calls. It was in Africa that this type of telecommunications business was invented because there is quite expensive international communication but mostly local call prices are cheap. The Republic of Chad is one of the African countries that is potentially attractive for voice traffic terminators. 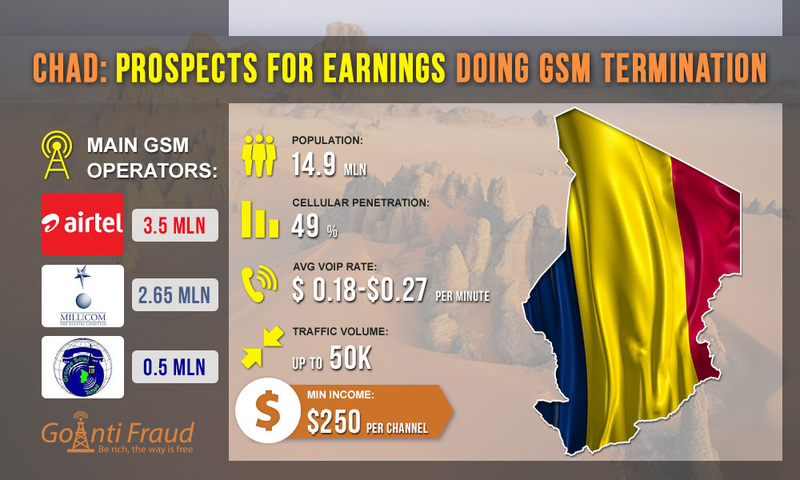 Chad is characterized by the least developed telecommunications market in the world, while penetration in all sectors (fixed telecommunications, mobile communications and Internet services) is below the average for Africa. Nevertheless, recent changes in legislation have ensured the development of the market. To date, in Chad, the cellular penetration has reached 49% (with a population of more than 14.9 million). The mobile sector is developing steadily. It is represented by 2 competing GSM operators - Airtel and Millcom. The third mobile operator in the market of Chad is the national telecommunications company Sotel Tchad. A SIM-card costs about $2 in the Republic of Chad. The standard rate for local calls is about $13 cents but prepaid packages also provide more advantageous offers. In Chad, a high rate is from 18 to 27 cents, which makes it possible to make good money. If you install VoIP call software and GSM gateways in this country, you will make at least $250 via 1 channel. Multichannel equipment, located in different parts of the city, will allow you to increase earnings exponentially.